Warning: This review contains a third act spoiler. Never read. In late ‘80s set Atomic Blonde, the camera pans to James McAvoy’s television and an MTV news anchor asking the big question, “sampling – is it art or plagiarism?”. Well, such mischievous archive sampling is typical of contemporary movies – self-reflexivity, in jokes, tongue in cheek self-deprecation. David Leitch’s espionage thriller, based on a graphic novel and just as glossy and two dimensional, is a movie that consciously appropriates another era, incorporating turgid and obvious music choices; it attempts to recapture the cold war dynamics of yesteryear. It is an act of sampling. But is neither original or personable enough to be a work of art in its own right. Leitch’s movie frustrates as much as it superficially entertains, because had the director, formally one half of the duo behind John Wick, had the courage of his artistic convictions – if he’d been inclined to make something ontologically pure, instead of the curious compromise made, Atomic Blonde might have been a glorious and unapologetic throwback to a more brazen, excessive era of practical but highly stylised action, and uncompromising heroes. Instead, we get a strange fugue of old school stunts – cars with visible roll cages that duly flip over, and the CG augmentation of fights and injury detail. Why, we ask, if you’re minded to use modern tools to stage setpieces would you not remove the practical tells from others? But Leitch, a man trapped between two eras, is either unwilling or unable to regress to the devil-may-care, pre-digital world of his ‘80s forebears. Instead, he recreates the tastes and iconography of the period without employing the cinematic vocabulary and ideological certainty that would have rooted us in the era. 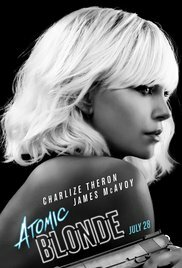 Atomic Blonde is a revisionist cold war movie, with a broad and uninspired reimagining of the ‘80s (a London bus drives past sporting an ad for abolishing apartheid) merely the background for a very contemporary, and slightly muddled plot about moral ambiguity and realpolitik. These are more themes than hard beats, however, as Leitch spends much of the film buffing up the visuals rather than generating tension and memorable character dynamics. Charlize Theron, here an exact replica of Glynis Barber in Dempsey and Makepeace (one hopes intentionally) plays not a double but triple agent. This, perhaps, explains the personality void that stalks the movie, leaving a hole where its charisma and vitality should be, and it definitely explains the poor British accent (the CIA should have done better), but not Theron’s decision to remain so cold. In contrast, James McAvoy is lively and sleazy, but neither makes any great impression in a movie that struggles to transcend mere impressions. All the emphasis is on placed on action and its presentation, while the stuff the audience salivates for – charismatic leads and intricate chess-move plotting, remains sadly stranded in the past. Certificate: 15 for the unimaginative casting of Toby Jones, not using David Hasselhoff's "Looking for Freedom" on the soundtrack, and a lack of '80's grit.